Our current Musical Director, Koh Tian Yi, is a classical pianist, vocalist, and choral conductor. He received piano Performer's Certificate at the age of 15, and later, he passed his piano LTCL certificate with distinction during University. In 2013, he graduated with a Bachelor Degree (Honour) Classical Piano from UCSI under the guidance of Professor Dr. P'ng Tean Hwa, the Director of the Institute of Music. At the same year, he was invited to be the music director of the Lollapalooza Singers. He is currently the president of the Klang Chamber Choir. Koh Tian Yi has been very active in the music scene in Malaysia, where he grew up. He has performed in several countries, including Thailand, Singapore, China, Korea and Italy, as well as all over Malaysia, where he was invited to participate in the Klang Music Festival for several years running. He has also won several gold medals in major competitions. In 2014 he performed the baritone role, Pish Tush, in The Mikado, with Young Choral Academic Productions. The following year he was invited as one of the four guest conductors in the choral project 'Voicestra', and he followed this up in 2016 at the second Voicestra project as the pianist accompanist in the performance of Carmina Burana. He was then offered a place at the Birmingham City University Conservatoire on the Masters Programme, where he majors in Choral Conducting. Jason began music at a young age. With his serious passion for choral singing and the repertoire of the Countertenor voice, he began his musical path at the University of Chichester, under the guidance of the Heads of Voice, Susan Legg and Neil Mackie. Whilst there, he sang with the University’s Chamber Choir and Otter Consort and held the post of Director of Chapel Music from 2011 to 2013. Whilst studying at the university, Jason entered various competitions, singing for Sarah Walker, and was awarded a prize at the Robert Headley Memorial competition in 2011. Jason graduated from the University of Chichester in May 2013. In September 2015, he was awarded a place and full scholarship at Birmingham Conservatoire to study a Masters in Vocal Performance. This has engaged him in learning Vocal Science, whilst he has focused his first year of study towards Historical Performance Practice and a research module into the influences Europe had on the Russian Sacred Tradition. He has performed with the members of the early music department and has sung in some of the specialised competitions the conservatoire holds throughout the year. Alongside his performance career, Jason teaches singing at Stratford Music Centre and is Vocal Coach to the choristers at St Thomas’, Stourbridge and Worcester Cathedral Voluntary Choir. Whilst studying at Birmingham, he sings as the Alto Choral Scholar at Worcester Cathedral and studies singing with Ms Yvonne Sandison. Daniel joined the choir as an interim conductor to help us through the difficult period after William Waine's move to Chichester Cathedral. Daniel chose to apply for the post and was a clear favourite with members. Daniel has recently completed an M Mus at the Birmingham Conservatoire and is now studying for a PhD. Daniel is originally from the United States of America and brings with him a varied and interesting musical background. He is an accomplished viola performer and has also been involved with bluegrass music amongst other things. 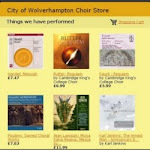 William Waine joined the City of Wolverhampton Choir as Musical Director on 11th November 2013, finishing his tenure at the end of March 2014 after a necessary job move took him too far away from Wolverhampton to continue in post. William will be at Chichester Cathedral from mid-April 2014. William recently graduated from Oxford University (although perhaps some may be surprised that this was in law rather than anything music-related) and has decided to pursue his musical career by taking up a post as a choral scholar at Gloucester Cathedral. William's musical experience goes back to his first performances as a chorister at the tender age of 6. His first conducting performance in front of his choir was at the age of 14 and since then nothing has held him back. In his days at university he was a choral scholar at Christ Church Cathedral Oxford and the Musical Director for the Christ Church College Student and Staff Choir. He has developed considerable experience in his roles so far and has performed as far afield as China and New Zealand. 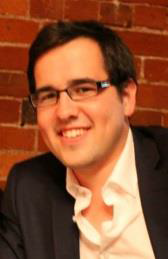 Joe Cooper was the Musical Director for the choir between 2009 and 2013. He began his musical life at St Peter's Collegiate Church in Wolverhampton where he was Head Chorister. Whilst there he gained the highest awards presented by the Royal School of Church Music. He went on to be a lay clerk and organ scholar. Joe now has a full time role at St Alphage in Solihull and is hoping to complete his studies at the Birmingham Conservatoire where he specialises in the organ. As a composer in his own right Joe has had his work performed by the Wolverhampton Symphony Orchestra.